One of the ways that Ultimate Jumpers, Inc. values their customers is through their package deals. If you have not heard of the package deals, they are an incredible way to make an initial investment in your inflatable rental business. There are a variety of package options available to fit your specific business needs. Naturally, an inflatable jumper package combo by manufacturer is an incredible way to save some money. In addition, there is another inflatable jumper package combo deal if you prefer larger jumpers for your business. Package #4 applies to any 3 jumpers that are 15×15 ft. Of course, this package also includes the accessories mentioned above. Additionally, don’t forget about the incredible warranties that come along with the jumper purchase. 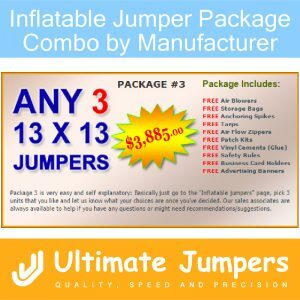 Check out the wide range of inflatable jumpers offered by UltimateJumpers.com and you will not be disappointed!